The Sony Xperia Note Flex could be the foldable smartphone to overshadow even the Samsung Galaxy X competition, if this new video proves accurate. 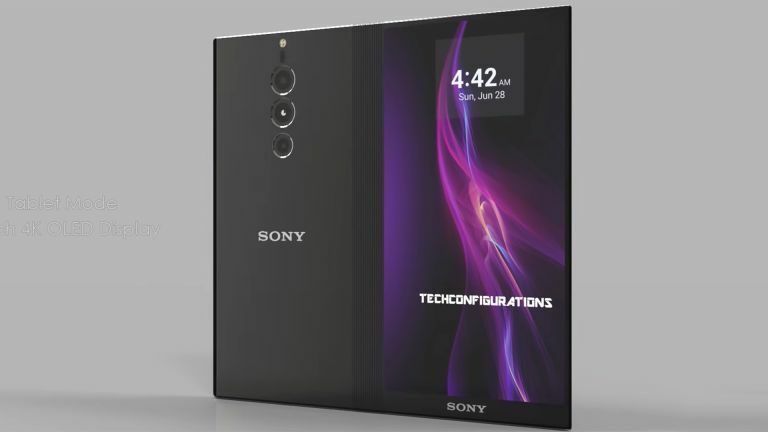 A fresh video showing off the concept of a foldable Sony phone has appeared online, compliments of design specialist TechConfigurations. The site has decided to go with the name Sony Xperia Note Flex for this potential future handset. As you can see this is not only a foldable phone but a stylus toting tablet device. On the rear, when folded, is a triple lens camera setup as well as a slither of screen down the side which offers at a glance notifications and quick camera access. When folded out the handset becomes a full tablet with near bezel free display that's ideal for using that stylus on. This is an 8-inch OLED screen which folds down leaving the smaller 5.7-inch screen for phone mode. Of course at this stage, where leaks and rumours are still rare, these specs are pure speculation. We like the detail shown in this video which takes into account the hinge mechanism. Until the Samsung Galaxy X lands, likely first, early in 2019 we'll have to continue using concepts like these to get a glimpse at one potential future for smartphones.